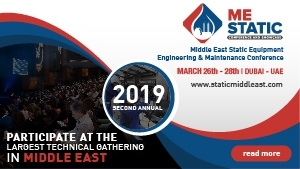 The 2nd Annual ME Static 2019 will be a high net worth technical conference with the latest equipment and technology available in the market to showcase the importance of the current need today and to adapt the cost-effective methods that will enlighten the end users and operators. The program will forage a wide range of topics distinguished by the subject matter experts to feature engineering, design standards with maintenance & reliability as a special focus due to the sheer number of dwindling equipment and quantity of stored fluid in refineries or a petrochemical facility. The necessity to upgrade/replace will connect manufacturing, commissioning, and processing experts, both regionally and internationally around the wider world to address the best practices and to implement the appropriate and right service providers. For abstract/papers submissions please write here. For registrations and sponsorships, please use the contact form on the right to contact Mr. Andrew Thomas.